Stamping with a Passion! : Taylored Expressions September Release: Give Thanks! Taylored Expressions September Release: Give Thanks! Hello everyone....today is the September Release Day at Taylored Expressions!!!! All the fabulous new products are available for purchase in the *New* section of the Taylored Expressions store...WhOOT!!! Be sure to stop by the TE blog, also, to see if you are a winner...hope this is your lucky day!!! My card features the awesome new Birch Tree Background, the Fall Florals Stamp Set, and the Fall Florals Dies. I love, love, love the Birch Tree Background stamp...it would be perfect for any themed design!!. The background was stamped with Versamark and embossed with white embossing powder. The Fall Florals images were all stamped, cutout with the coordinating dies and popped up with foam tape. The sentiment from the same set was also stamped with Versamark onto Mulled Wine cardstock, embossed with white ep, and cutout with the previously released Stitched Banner Stacklets. The twine is the finishing touch. Thanks for joining us this week for the TE September Release....I hope you had fun and found a little inspiration along the way!!! Soo Beautifully Fall-icious Miss Joan! 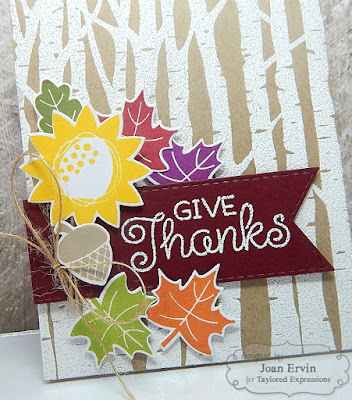 Love the Birch Tree BG and your Wonderfully arranged Fall florals too! LOVE the backdrop of white trees behind the wonderful fall colors of your flowers and leaves.